We’re pretty spoiled here in Florida with our year-round picnicking weather, so kick off your flip-flops, spread out, and enjoy a day at one (or all!) of these charming spots. Local Realtors® submitted many of these picnic picks — they always know where all the best stuff is, don’t they? Picnic under old oaks, stroll the arched footbridges and rent a canoe or kayak. Oh, and you can bring your pup! You knew this park was going to be on the list, right? Of course it is! We love Lake Eola. This park is a gem nestled in a quiet Winter Park neighborhood. There’s a lovely boardwalk trail, butterfly garden and native plant demonstrations. Howell Creek runs along the back of the park. Dogs are allowed. 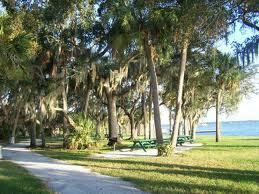 ONP is a 128-acre preserve on the southern shore of Lake Apopka. You’ll likely spot gopher tortoises. There are live animal exhibits, gardens, boardwalk trails and a visitor center with delightful rocking chairs out front. Canoe and kayak rentals available, pristine lakes. Bring your bicycle — there are extensive paved and unpaved bike trails. A national model for wetland restoration, DWP has more than 1000 species of plants and animals. Hike a one-mile trail to the shore of Lake Russell. Paved trail, boat ramp, bait shop that rents fishing gear. Free movies! Gorgeous gardens and a unique singing tower with a wonderful Koi pond. “Public events include concerts under the stars, where you are encouraged to picnic with friends (and there are even contests for the best-dressed picnic table!) … I love it! !” –Lynne H.
Picnic on an island for the day — you live in Florida so it’s totally doable! Ferries leave from the Sponge Docks at Tarpon Springs. “Forget the Bahamas, come to our Island, Anclote Island!” –Yvy P.
Picnic at Curtis Hixon Waterfront Park and watch boats cruise by and the buildings light up at night. The Tampa River Walk has enough to do to fill a weekend, let alone an afternoon. Enjoy! Educational guided tours, lunch spots by the lake. “Beautiful, wide-open park. Nice walking path, lush green grass, and plenty of shade trees!” –Adam G.
The name says it all! Seriously, it’s a breathtaking beach. There’s a dog beach, too. “Honeymoon is friendly to critters, offering a dog beach that is a half-mile hike off the main road.” –Joe P.
Features outdoor living rooms and a Tidal Discovery Zone. Enjoy the “Sport of Kings”! Dogs okay on a leash. Historic fort, fishing and one of the few beaches you can take your dog to. 21-acre living history museum with dozens of historic structures. “This great beach in our lovely town sits right on the Gulf of Mexico. It is lovely because it’s not overly commercially developed.” –Pamela C.
Free concerts happen often here. “Under a Golden Rain tree … it’s the best spot around.” –Kimberly G.
In rural SW Fla., this place is truly wild! Eco-tours are available. Wildlife viewing is practically guaranteed.